Bad Horse Should Feel Right at Home! Cow-town has managed to snag the first professional production of Doctor Horrible’s Sing-Along Blog. Hardly surprising when you consider Doctor Horrible is trying to join a gang of supervillains lead by Bad Horse, the Thoroughbred of Sin. There are even singing cowboys! Neil Patrick Harris was even willing to take part in the production, but unfortunately scheduling conflicts mean that Jon Lachlan Stewart will be taking over the role of Billy/Doctor Horrible. No word yet if Edmonton native Nathan Fillion will reprise his role as the pompous Captain Hammer or who will play the role of our plucky heroine, Penny. 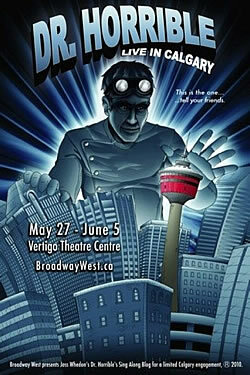 Presented by Broadway West Productions, Doctor Horrible’s Sing-Along Blog will run from May 27th to June 5th at the Vertigo Studio Stage. There are still some tickets available although more than half are already gone. You can get them at the Broadway West Presents website or by calling 403-221-3708. Get them soon. We don’t want to cause a stampede! The promo’s for next week’s highly anticipated episode of Glee, directed by Joss Whedon and guest staring Neil Patrick Harris is up! OMG! Mr. Shue’s hair! That SHIRT!! This looks like an out-of-this-world episode. I’m more amped for this one than I was for sectionals. And what are we going to find out about Rachel’s mom. Is it Shelby? It looks like Matt Morrisson and NPH really rock out to Dream On, which is one of my favorite songs – okay, The Mission’s version of Dream On is one of my favorite songs. I’m speechless. Puck? Brittany? KURT???? The 8-bit Masterpiece is finished! 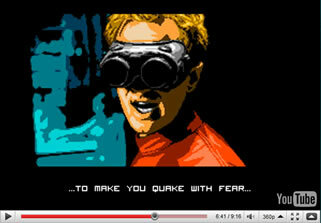 Doctor Octoroc’s 8-bit tribute to Joss Whedon’s Dr. Horrible’s Sing-Along Blog is finished. For those who haven’t been following, this is basically an 8-bit graphical version of the original internet serial. In other words, if Whedon had done Dr. Horrible as a Nintendo game instead of a series of short films, this is probably what fans would have got. Put together, all four videos clock in at about 30 minutes. As someone who has worked in Flash, that’s a ton of animation work, and it is so well done. Congratulations. Check out Dr. Octoroc’s other projects. These were a lot of fun. I can’t wait to see what he tackles next. Maybe full length feature films? The next chapter of Doctor Octoroc 8-bit video game adaptation of Doctor Horrible’s Sing-Along Blog is up. This is so well done. I can’t wait to see the final chapter. Screw the Emmys, go for an Oscar! According to Neil Patrick Harris, the sequel to Doctor Horrible’s Sing Along Blog will be a FEATURE FILM! “That’s their plan. I don’t know of what scale. They’re talking all options, because they made the first ‘Dr. Horrible’ in five days on no budget at all — that was its intention. “You don’t want to necessarily make the feature film be an $80 million giant movie, because it defeats the purpose of what the first film was made to be,” he explained. “Then again, you don’t want it to be so low-brow that it’s not worth paying money to see as a movie.” Check out the rest of the interview at MTV News. Of course, nothing is set in stone. All the principles are very involved in their own projects: NPH with How I Met Your Mother, Nathan Fillion with Castle, Felicia Day with The Guild and Red. Never mind that Joss is currently working with Eliza Dushku developing a feature movie of their own. Availability is going to be a big stumbling block to getting this off the ground. But I have faith. It will get done and it will be awesome. PS. The totally awesome graphic of Dr. Horrible (post Penny) was drawn by the fantabulous Cheyenne Wright – he of the buttery man-voice. He’s also the colorist behind the phenomenal Girl Genius comics by Phil and Kaja Folio. You need to check out his work at Arcane Times Concept Art Blog. If you’re looking for Dr. Horrible Inspired wallpapers, look no further. I am a Gleek. I am an unabashed Gleek. I can pretty much point at each member of that cast and refer it back to someone from my high school yearbook. So you’re going to see a lot of Glee news on this blog. Could this mean a dance off between Doctor Horrible and Mr. Shue? If there’s a Goddess, and if she loves me, there will be! Please! Please! Please! Read the rest of the interview at EOnline. So, is Will going to get it on with April (Kristin Chenoweth), or is he going to make time with Indina Menzel’s new character? I just hope they don’t mess with Will’s character too much. I love his earnestness and his honesty and I’ll really, really hate him if he breaks Emma’s heart. And finally, the cast has announced the cities and dates for their summer tour. Unfortunately they *won’t* be coming to Canada. UPDATE: American Express pre-sales started today. 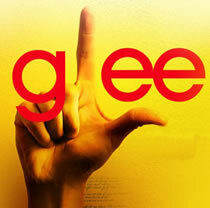 Get more information at the Glee Live Website. Interesting rumors floating around the Interwebs today. It was reported early this morning that Marc Webb had found his Peter Parker for the upcoming Spiderman reboot. News was that Logan Lerman, lately of Percy Jackson and The Olympians: The Lightning Thief, was going to pull on the red and blue pyjamas and start swinging around NYC. “Not so fast!”,said Sony. According to the studio, no decision has been made regarding any of the cast as of yet. They aren’t even in negotiations with anyone! Better let Logan know, supposedly he’s been talking about the role as if he’s in the running, which according to Sony, he’s not. 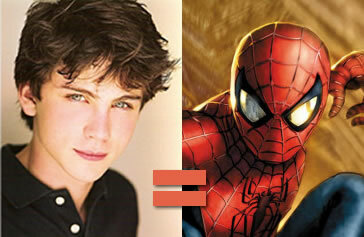 I don’t know though, he looks like a good fit for a young Peter Parker, and he’s a vet – he’s been acting since he was 8. He’s only 18, so there’s a good bet he’ll be up for an extensive franchise. I haven’t seen him in anything yet – I want to take Scotia to see Percy Jackson on March Break – so I’m not sure how good an actor he is. Anyone taking on the role will have some pretty big shoes to fill. Tobey Maguire really inhabited the role of Peter Parker. What do you think? Who should play Peter Parker/Spiderman in the reboot? In other interesting casting news…. This elicited a ginormous WTF out of me? Doctor Horrible as a SMURF? I’ve been waffling between “How cool is that?” and “What is the world coming to?” ever since I heard this tidbit. Well, Neil Patrick Harris is *NOT* playing a Smurf. Apparently he’s playing the live action lead – an expectant father who’s life gets complicated when he stumbles onto the Smurf village. I love the Smurfs. I read all the books in French when I was little. I remember being so excited to go see “La flûte à six schtroumpfs” (The Magic Flute for you non Frenchies), but I’m really not feeling the love for this movie. 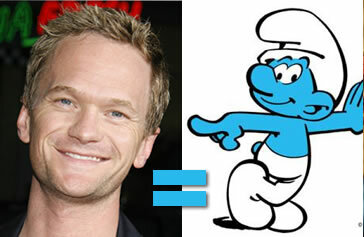 Maybe if NPH was playing Gargamel, now that I could get down with. I guess I’m just worried that a beloved piece of my childhood is going to go the way of The Chipmunks – un-funny, soulless money making machines. Or maybe I’m just becoming a curmudgeon in my old age. The other thing is that I don’t want to see NPH’s career follow the same path as Brendan Frasier. Going from The Mummy to schmaltzy kid friendly fare like Furry Vengeance and Inkheart. That would not be good.